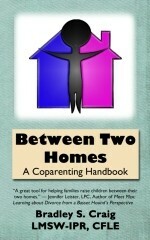 Between Two Homes: A Coparenting Workbook is a companion workbook to Between Two Homes: A Coparenting Handbook. Between Two Homes: A Coparenting Workbook has questions and exercises to assist adults in coparenting their child(ren). It is recommended each coparent complete the workbook under the direction and instruction of their counselor, attorney, parenting coordinator, or other mental health professional. If you would like to purchase bulk orders for your clients at a discounted rate plus tax, please use drop down menu to select the amount, and use the buy now button below. If you are a professional working with families, and would like the answer key please contact support@childreninthemiddle.com for the confirmation process. After confirmation, you will be billed $30.00 and the key will be sent to you. If you bulk order copies of 100 or more, the answer key is free. BTH Publications, A Division of Between Two Homes, LLC.